DD Hi Cedaa, welcome to Disco Droppings. I’ve done a few features with III Cosby who runs Car Crash Set, excited to collaborate with the label more. C Thanks :] Yeah Cosby is great, same goes for the whole CCS camp. I encourage everyone to check out their catalog. Quality and diversity. 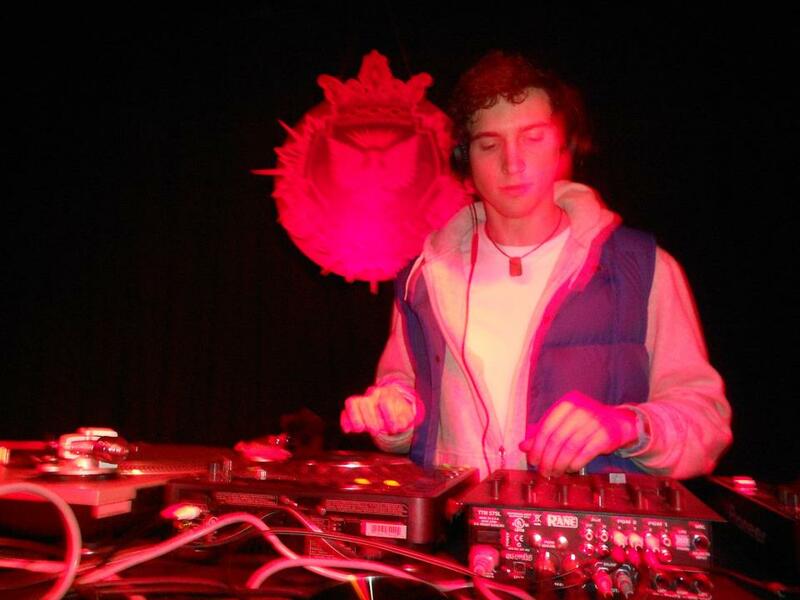 DD I think I saw you at the Night Slugs showcase for Decibel Festival..did you enjoy yourself? That was my favorite showcase for sure! Fun group of guys. C That was my favorite event of the festival as well. Great energy, stellar sets from all involved. The Baltic was buzzing that night. The tag-team was definitely a moment. 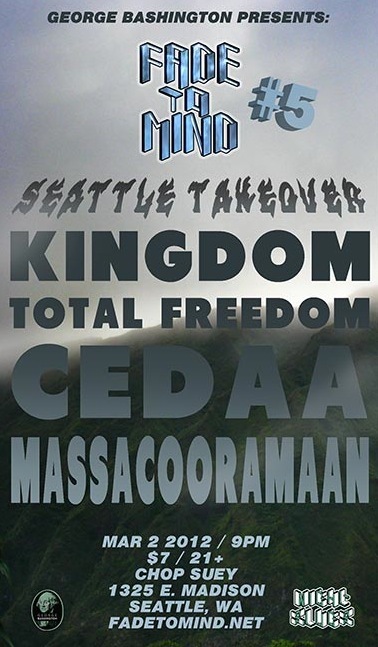 Really excited to play with Kingdom this Friday at Fade To Mind # 5 Seattle Takeover, along with Massacooraman and Total Freedom, two other Fade To Mind artists. Friday’s show should prove a night to remember as well. 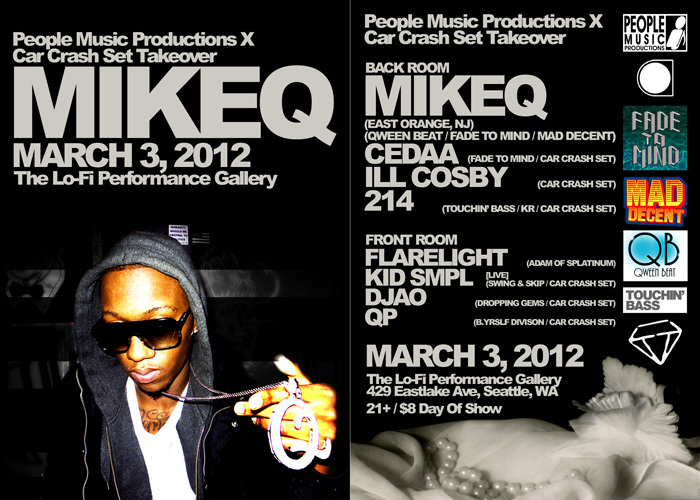 Plus MikeQ is in town the following night! Can’t wait. DD Looking at young producers from NW starting to establish themselves, you’re name stands out for gaining national and international recognition. Artists from Car Crash Set and Dropping Gems are getting strong visibility as well which is rad. Now that you’ve teamed up with Kingdom and Fade To Mind, how has your perspective/vision changed or evolved? How do you hope your upcoming Fade To Mind release will resonate with the music community? Id like to think my music and tastes are ever-evolving. Joining Fade To Mind has influenced that evolution, but many other things have as well. I am always becoming myself lol. I’m taking more time with my next ep than I have in the past. Bit of a change from the workflow of some of my previous releases. I aim to put out a record that is both provocative and fun. Unorthodox club music. DD Has your studying of Cultural Anthropology influenced your work as Cedaa? C I suppose it has in a way. I find regional music scenes extremely interesting, specially within America. Juke, Bounce, Jersey Club, the many flavors of hip hop, etc. Internet culture appeals to me in the same way. Anthro theory applies in to many situations not to notice. Many others who do not study anthropology share these same passions tho. DD What’s the biggest challenge you face as an artist? C Getting thru school probably. DD A few of your all time favorite songs?